Powers/Abilities: The Quintronic Man is a giant robot (9m. circa), with 5 pilots, one in the head, and one for each arm and leg. It has super-human strength (class 10-25? ), high durability, protective shields, tele-scanner, gyroscopes, retro-jets for short flights, thrusting blasts, and soporific (anesthetic) gas. History: (Incredible Hulk II#213 (fb) - BTS) - The Quintronic Man was created by Stark International for interstellar exploration at a cost of millions of dollars. One day, the police asked Stark International for help against the Hulk. (Incredible Hulk II#213) - The Quintronic Man was transported to Manhattan to test it against the Hulk, who was trying to avoid some "puny humans with guns". Initially, the Quintronic Man's strength defeated the Hulk. McCord (the left arm) repeatedly hit Hulk, acting without any order by the "head". But Hulk wasn't dead, and he retaliated. The thrusting blasts of the robot didn't stop the Hulk, but the soporific gas did it. The Quintronic man watched while the policemen loaded the jade giant on an armor-plated van and escorted the van. Jim Wilson caused the van to crash into a wall, and the collision woke the Hulk up. His blow broke the mechanism of the protective shields of the Quintronic Man. The Quintronic Man tried to use the gas again, but Hulk obstructed the exit hole of the gas and the gas permeated the pilot cabins, putting the pilots to sleep. The Quintronic Man, without any operators, fell into an already damaged building and was buried by the structure. (Incredible Hulk II#214) - The Quintronic Man was under the debris and the Jack of Hearts helped the policemen to free its pilots. (Nova III#3 (fb) - BTS) - The Quintronic Man was rebuilt and repaired, possibly by the Reanimator, who would have obtained it under uncertain circumstances. (Nova III#3) - The Reanimator sent the Quintronic Man, operated by a quintet of Nick Fury Life Model Decoys (LMDs), against Nova. After a short struggle, the Quintronic Man stomped Nova into the ground, but the hero overloaded and incapacitated the robot by flying up through its leg and exploding out of it. (Wolverine II#149) - The Reanimator brought the Quintronic Man back to his base to begin repairs, but his operation was discovered by Wolverine, who was soon followed by Nova. Wolverine was able to topple the Quintronic Man in battle, damaging it once again. (The Last Defenders#3-4) - The Quintronic Man was obtained by the Brand Corporation and peopled by their staff to protect their processing facility on the Atlantic Ocean. When the Defenders invaded the operation, the Quintronic Man went into battle against Atlas, Junta, Paladin and Nighthawk; it was ultimately smashed apart by Atlas. (Civil War II: Amazing Spider-Man#2 (fb) - BTS) - The Quintronic Man was rebuilt, possibly by a scientist and his colleagues. But the group employed the robot when it was still not ready because there was a flaw involving the overheating of the core. Ulysses, an Inhuman with foreseeing powers had a vision involving the Quintronic Man and a gigantic explosion destroying half of Long Island. The Inhuman warned Spider-Man about the danger and the hero intercepted the robot where Ulysses had predicted. (Civil War II: Amazing Spider-Man#2) - The quintet tried to kill Spider-Man, using tracing bullets and gas, to no avail. It was in that moment that Peter Parker's scientific knowledge helped him. 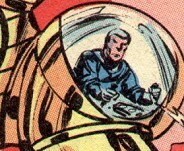 Spider-Man suggested to "Head" to check the temperature of the core, actually, the Quintronic Man was going to explode. "Head" set the automatic pilot up, in order to drive the flawed robot into the Hudson. Spider-Man managed to extract the pilots from their shells, just in time. The Quintronic Man sunk, and the core cooled down. (Civil War II: Amazing Spider-Man#2 (fb) - BTS) - The five pilot-scientist were arrested. Comments: Created by Bill Mantlo, John Buscema and Tom Palmer. Profile by Spidermay, Snood and Prime Eternal. Each pilot controlled a limb, with the related weapons and tools. Head had coordinating and checking tasks. They could communicate with each other via radio (internal comm?). Probably the operations of the robot was very complex, because it needed 5 pilots, and it didn't have a security system that could bar out one of the pilots and give the control to another one. (Incredible Hulk#213 (fb) - [BTS]) - Head ("Burk") was probably the leader of the group. Before the test on the field, Head warned Tony Stark that McCord was a risk for the group. (Incredible Hulk#213) - Head gave orders, coordinated the units, and made the system checks. Initially he seemed very self confident, but after some minutes against the Hulk his authority wasn't so strong. Head soon found a weak spot in the robot: if the crew didn't act accordingly, the whole robot acted badly. (Incredible Hulk#214) - Two cops were extracting "Burk", unconscious, from the Quintronic Man. (Incredible Hulk#213 (fb) - [BTS]) - The Right Arm pilot was McCord. 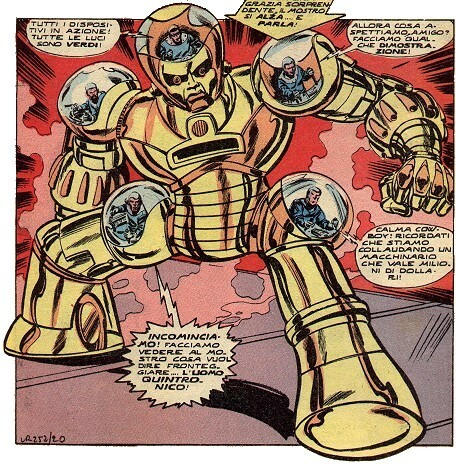 McCord wasn't considered the right man for that work by Head, but Quintronic Man was called into action before Tony Stark could substitute him. (Incredible Hulk#213) - McCord was probably driven by his dominance behavior. He hit Hulk again and again with the clear wish to kill him and without any authorization by Head. He didn't stop at Head's orders and clearly declared himself happy that he couldn't be stopped. The Left Arm pilot was Stetson. He was nicknamed "Cowboy" by Left Leg, because of his attitude. Left Arm was swift to slap the Hulk at his second attack and suddenly understood that it was a hard job. He also fired the thrusting blasts which didn't stop the Hulk. The Right Leg pilot was Van Dyke. He was the first one to drive back the Hulk when he attacked the "Iron Man". Head called him "Right Leg" but he didn't like it and wanted to be called by his real name. He also used the retro-jets to fire at the Hulk and melt the asphalt around him. The pilot of the Left Leg was "Deckelbaum". He tried to extinguish Stetson's enthusiasm, telling him that they were doing a serious job. He also fired at the Hulk with the retro-jets, driving him back in the melted ground.